When discussing creatures of folklore, regardless of how odd they may seem, there is usually some kind of logic buried there. A reason why it is so ugly or a mish mash of different creatures, etc. Then again, occasionally you stumble across one like the munuane. The munuane’s purpose is fairly common, he’s the animalistic guardian demon of water, the water’s inhabitants, and people who live by the water…assuming they don’t get greedy when it comes to fish. Folklore like this helps discourage people from over fishing, or harassing local residents of water based communities. It is said in South America that a munuane is found wherever the fish are plentiful. The munuane defends the local residents by use of bow and arrow. It is such a precise shot that it only carries a bow and one arrow. The munuane never misses. Okay, so what is so darn weird you ask? Let me tell you what this demon looks like. It is a gray haired demon with no teeth, and…its eyes are in its knees! 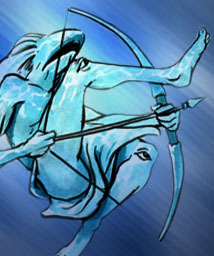 Yep, the master archer lines up its shots with its eyes below the waist! That is one archer extraordinaire. If you ever find yourself in a position where you have to fight one, go for the eyes, by going for the knees!